For the most part, Outlander is very much an “outside” story. There’s lots of sleeping rough on the road, horse riding through the Highlands, campfires and buggy roadside inns. In other words, unlike Downton Abbey, there’s not much in the way of fine interiors and “Get that look” opportunities. So, while I adore the story and this television production, I am a little starved for just some pretty set decorating. This week’s episode on Starz features a very beautiful interior (finally!) that could be brought right into the present day. Our heroine, Claire, is still looking for a way back to the standing stones in hopes of getting back to her own time and husband. So, when a British officer comes across her in the company of the Scottish MacKenzie’s on the road and takes interest in her welfare, she’s all too happy to head off with them in hopes they will give her transport closer to where she needs to go. By this time, however, she has developed an affection for the Scots and isn’t interested in turning them in for holding her captive – though they have in truth been holding her against her will. Most of the episode takes place in the dining room of a British Garrison in a small town in the Highlands. Claire joins a group of British officers who at first seem very cordial and “her people”. Well, cordial to Claire, an English Rose as she’s called, but not so much to Dougal who has accompanied her to the Garrison. Dougal (on Claire’s right) is treated with great disdain by the British as at the time they saw the Scots, in particular the Highlander’s, as nothing short of un-educated savages and barbarians. Claire has managed to charm the officers and has received an offer to be escorted back to Inverness (which is near the standing stones) without implicating the MacKenzies in any way and she’s ready to be on her way. And then enters Captain “Black Jack” Randall, who is Claire’s 20th century husband’s ancestor (both characters are played by Tobias Menzies in a real tour de force performance). Randall, who is clearly disliked by his fellow officers, manages to put into question why Claire spent so much time with the MacKenzie’s if she is so innocent – even accusing her of bedding Dougal. Needless to say, she takes umbrage with this but he keeps needling her until she loses her temper and shows support for the Scots and criticizes the British for being occupiers. Well, them’s fighting words, obviously. Eventually, Claire is left alone with Randall, who proceeds to question her loyalties and to show his hand for being the sinister and depraved character that he truly is. While Claire keeps trying to find some good in him (since he is her husband’s ancestor) he plays on this weakness of hers in a devastating way. While recounting how he flayed open Jaime’s back a couple of years before in excruciating detail, he’s showing how much he got off on the lashing and how he felt that Jaime played a part in the macabre dance by refusing to yell out or ask for mercy. The flashbacks are gruesome and even when the visual is only Randall talking in the dining room to Claire, we still hear the lash. I had to turn the sound off and look away for a bit – it was that awful. All the while, he’s allowing her believe that he feels deep guilt for his behavior and she’s thinking that he’s possibly redeemable. And then he punches her in the gut – literally. In a scene not from the book, we see Randall being shaved by his servant using a bone handled straight knife. While Claire’s is watching him being shaved, she flashes back (forward?) 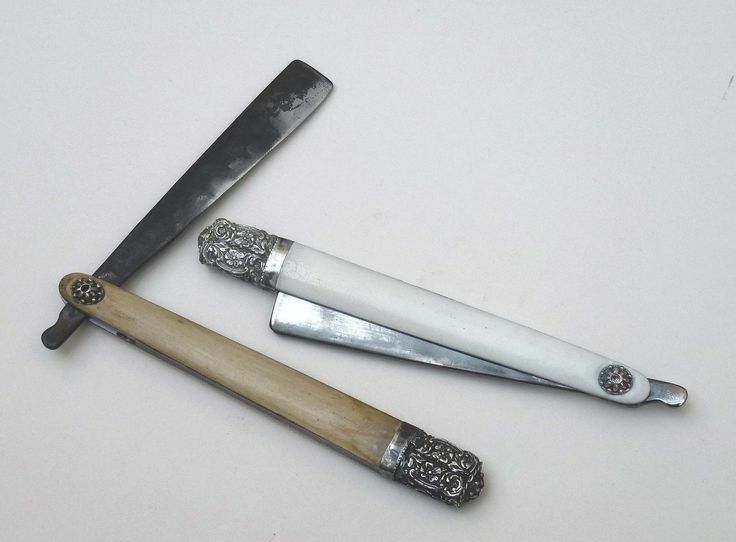 to having shaved her husband Frank with the very same straight edge blade – which he says was a family heirloom. In this closeup, we see the blade with over 200 years of aging. In doing research on the set decorator Gina Cromwell, I ran across a website for Whetton & Grosch who are model and props makers in England. They made the prop blades both “new” and “aged”. It’s a small detail – recreating a straight edge to be new and then aged 200 years – and one I wouldn’t have necessarily noticed – that makes this production so special. From the costumes (by designer Terry Dresbach) to the props and sets – production designer John Gary Steele is creating a world that is true down to the small details that may not even be noticeable, but are so authentic. If you check Whetton & Grosch‘s website, you will see other familiar props – including Mr. Bates’ doomed leg brace from the first season of Downton Abbey. Next week’s episode is the one all Outlander fans (especially the women) have been waiting for – “The Wedding”!